Authentic Geek! : 'X-Men' Inspired Toilet For Sale or "Protecting A World That Had Mexican Food For Lunch"
'X-Men' Inspired Toilet For Sale or "Protecting A World That Had Mexican Food For Lunch"
First, the Star Wars 'Admiral Ackbar' toilet ("You Know You Want One"), now this. 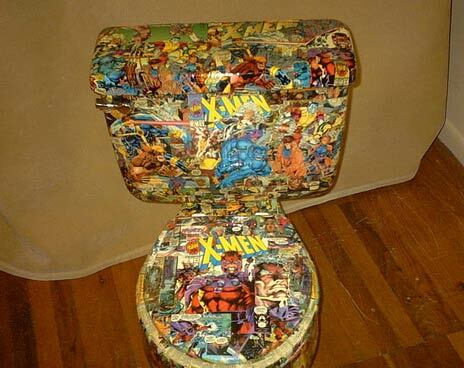 Using copies of the different 'variant' covers (a popular trend of the 90s) of "X-Men #1", an X-Acto knife and a LOT of glue, eBay user xenonouveau has created an amazing and somewhat bizarre expression of nerdy comic love and pop art in the 'Uncanny X-Toilet'! He says that it probably would work if you hooked it up, but he wouldn't recommend it, as water would definitely ruin the interior. And why would you want to? This is art! Nerdy, obsessive, 'WAY too much spare time on his hands' art!! It takes 'reading in the can' to a whole new level.